Councillors from across the political spectrum have convened a series of special meetings, to debate a series of motions that would strip just about all of Rob Ford's political power. Rob Ford conferring with several councillors at City Hall on Wednesday. Earlier this week councillors took symbolic action against Rob Ford, asking him to apologize and take a leave of absence. 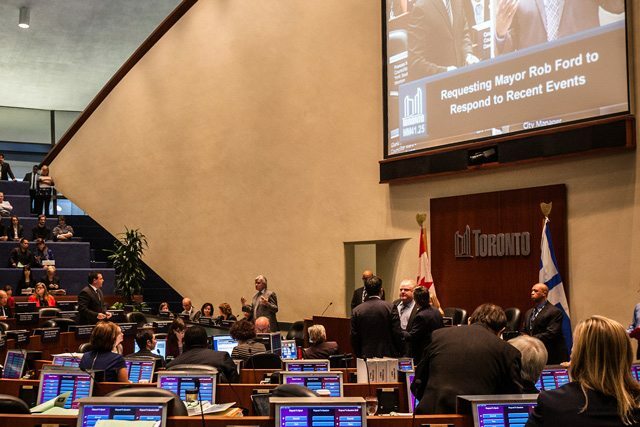 They have no power to compel him to do those things, however, and so today they begin debating a series of much more practical actions—ones that would, collectively, effectively reduce the mayor to the status of any other councillor. Live updates right here, for as long as the debate lasts. 11:13 AM: And that’s it for today. Because special meetings require 24 hours’ notice, the last debate—the newest one, regarding the mayor’s budget and staff—will be held on Monday. We’ll be back here for that. In the meantime, council will return to its regular November meeting, where they will debate recreation user fees and other such routine matters. 11:11 AM: Voting! Motion to strip mayor of power to manage emergencies, etc. PASSES 41-2. Dissenters: Rob and Doug Ford. Absent: Gloria Lindsay-Luby and Giorgio Mammoliti. 11:00 AM: Anthony Perruzza (Ward 8, York West): the last motion, stripping the mayor of the power to appoint and fire committee chairs, was important and “brought stability” to council. But with this new measure, he says, they would be taking “the first baby steps” to exceeding their moral and political authority. “You win the election for mayor, you are the mayor. That is the people’s will. Who can change that? The people. Yes the Premier, maybe the courts. That’s it. We are not given by proxy the right to change that, and that is dangerous, if we do that.” Being “disgusted” with the mayor’s behaviour, he goes on, shouldn’t open the door to establishing precedents that could be invoked and exploited in the future for political ends. Perruzza’s argument is that council can take some power’s away from the mayor’s office, but cannot try to more or less create a new mayor, by investing the deputy mayor with almost all of the mayor’s powers. 10:52 AM: The mayor has the statutory authority to declare and end emergencies, the City solicitor explains, and council cannot remove that. But what they are trying to do is strip his power to manage events once an emergency is declared—that would transfer to the deputy mayor, though on-the-ground decisions would still be made by the City’s emergency working group. (Here’s the City’s official emergency preparedness plan [PDF].) So the public face of any emergency management would change—the deputy mayor would provide public updates and media briefings, for instance—but little else would change. 10:46 AM: So two quite separate issues here. One has to do with managing emergencies, and is fairly straightforward. The second item would ensure that the mayor couldn’t launch an attempt to undermine any of council’s accountability offices: the integrity commissioner, ombudsman, lobbyist registrar, and auditor general. The first of these is the most important: two days ago council voted to ask the integrity commissioner to investigate whether the mayor has violated council’s code of conduct and report back to them as soon as possible, so their goal is to protect her from retaliation. 1. Amend Chapter 59, Emergency Management to provide that the Deputy Mayor assume those powers and duties that have been delegated by City Council to the Mayor under its own authority, to be in effect until November 30, 2014. 2. Amend the selection process provisions of Chapter 3, Accountability Officers, to provide that the selection panels are appointed by the Deputy Mayor and chaired by the Deputy Mayor or the Deputy Mayor’s designate, to be in effect until November 30, 2014. 10:40 AM: “I don’t think we need to sing the anthem again,” says the Speaker. Onwards! 10:37 AM: Councillors who are absent: Gary Crawford, Gloria Lindsay Luby, Giorgio Mammoliti. 10:34 AM: Voting time. Motion to strip the mayor of his power to appoint and fire committee chairs PASSES 39-3. Opposed: Rob Ford, Doug Ford, and David Shiner. 10:33 AM: Ford says that he sees no problem with the current composition of the executive committee, which is willfully misunderstanding things. The motion specifically calls for retaining the current composition. 10:30 AM: Speaker: are there any further speakers? A chorus of ‘no’s. Then the mayor gets up. 10:28 AM: At any point in time a member of council can “call the question”—that is, ask for a vote on whether to halt debate and vote on the motion immediately. This would be an excellent strategy for those who want to curb the mayor: Ford’s banking on building up sympathy by looking like a victim, and the longer this debate lasts the more likely he will be to pull that off. 10:26 AM: That’s it for questions of staff. Now on to speakers. First up: the mover of the motion, John Filion. This “is done sadly, but we have reached the belief that it is warranted and necessary. This issue has united members of council certainly like they haven’t been united for this term of office. 10:22 AM: Rob Ford rises on a point of order to ask whether he has a conflict of interest. His lawyer says it’s up to the clerk, and the clerk says it’s up to his lawyer. Shelley Carroll (Ward 33, Don Valley East): “You have a bad lawyer!” Public gallery bursts out laughing. 10:19 AM: She says not very much—we’d be looking at a day or so of court time. 10:18 AM: Mayoral brother Doug Ford (Ward 2, Etobicoke North): “How much is this going to cost to the taxpayers, if it’s challenged in court?” Because that’s what’s important. @towhey: Rob Ford was/is a man in personal crisis. #TOCouncil is now pushing #Toronto into a civic crisis that threatens our democracy & economy. 10:09 AM: All the motions up for consideration have built-in sunset clauses, and are set to expire at the end of this term of council (November 30, 2014). (e) to carry out the duties of the head of council under this or any other Act. 2006, c. 11, Sched. A, s. 133 (1). (d) participate in and foster activities that enhance the economic, social and environmental well-being of the City and its residents. 2006, c. 11, Sched. A, s. 134. 10:02 AM: At issue here is a distinction between the mayor’s statutory powers—those established by the provincial legislation which forms the basis of the municipality (the City of Toronto Act, or CoTA)—and his delegated powers, which are conferred upon the mayor’s office by council’s own procedural by-law, and which are therefore subject to revision by council. Any revision to the procedural by-law requires a two-thirds majority of council, or 30 votes. All of the measures council is considering will need to meet that threshold. 9:58 AM: Next up, procedurally: members of council can ask City staff clarificatory questions about the motion before them. Ford does first, and is now asking the City’s clerk about the mayor’s authority, going through the various appointments (committees, speaker, agencies and boards, etc.) and asking how each would be affected by the proposed changes. 9:55 AM: More from Rust-D’Eye: there are “issues raised by the proposed actions” including questions about whether it undermines the role of mayor as established by provincial legislation. It is a fairly weak letter, however—notably vague, and without citing specific statutory provisions that prohibit what councillors are trying to do. 9:47 AM: We begin by asking whether anyone has petitions to introduce into the record. Michael Thompson (Scarborough Centre) rises with one from a group called SaveToronto.ca. They gathered about 1,200 signatures during an hour-long rally held in Nathan Phillips Square earlier this week, and are demanding the mayor’s resignation. 9:42 AM: Why that motion matters: committee chairs are the gatekeepers of council’s agenda, and have the biggest role in shaping what makes it onto the floor for debate. Ford has a history of firing people from committees when they disagree with him, so the effect of this particular motion would be to insulate councillors from political retribution. It would also reaffirm the current slate of appointments—a way of signalling that this isn’t an attempt to change the political direction at City Hall. All the current committee chairs were appointed by Rob Ford. 1. City Council suspend the power of the Mayor to appoint and dismiss the Deputy Mayor and Standing Committee Chairs under Section 27.40 of the Council Procedures. 2. City Council confirm the appointment of the incumbents in the offices of Deputy Mayor and Standing Committee Chairs for the balance of this term. 3. City Council confirm that the incumbent Deputy Mayor and the Standing Committee Chairs remain cross appointed to the Executive Committee. 4. If vacancies occur, that the Deputy Mayor be appointed by City Council and the Standing Committee Chairs be elected by the respective committees. 5. If a Standing Committee Chair resigns as a Chair and member of the Executive Committee, he or she would remain as a member of the committee on which they have served as Chair. There’s also a full explanation of the rationale for the motion available here. 9:34 AM: Special council meetings can be convened by petition, if a majority of councillors ask for one. They require 24 hours’ notice, and they must be devoted to narrowly-defined issues. Councillors have called for three separate meetings, to deal with three separate initiatives regarding the mayor. 9:32 AM: Council chamber is considerably more subdued today than it was earlier this week. The public gallery is full, but not overflowing and not raucous, and the media gallery is similarly at regular capacity, rather than packed three rows deep. Everyone—councillors, reporters, and political staff—is exhausted.